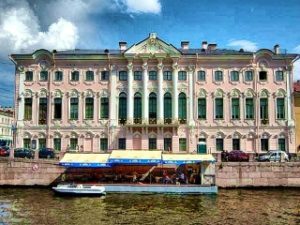 The Stroganov Palace was built in 1753-1756, by the project of the architect Federico Rastrelli. It has belonged to a famous and very rich clan, first barons, and later Counts Stroganov’s – who were a well-known collectors and patrons. Stroganov Palace is one of the best examples of Russian baroque architecture. The most famous architects – Voronihin, Rossi, P. Sadovnikov, G. Bosse and others were attended in the adjustments and design of the interiors of the palace. The pearl of the Palace is a Grand Ballroom – the only one interior in St. Petersburg, that has preserved the original decoration of Bartholomeo Rastrelli, with a unique ceiling painting “Triumph of the Hero” by J. Valeriani. The most interesting interiors of the palace were opened to the public in 2005, after completion of the restorations. Among them is the Mineralogical Cabinet of Count Stroganov (1791-1792 years, Architect Voronihin). The exhibition halls of the first floor hold the temporary exhibitions of works from the collections of the Russian Museum and other major art collections. This excursion is not available on Tuesdays. Tour includes roundtrip transfer and english-speaking guide assistance.